Image left: Constructing the Silver Line Metroline in Tysons Corner. On Tuesday, I went to a one-day regional conference on the regional outlook for real estate development, sponsored by the Bisnow real estate e-newsletters. There were four panels and all were quite interesting. Wearing two hats--looking for developers interested in better integrating bicycling facilities into their projects while still having my advocate's perspective in terms of pro-center city and optimal mobility development policies--made the conference especially interesting. For example, while it wasn't as surprise because that's how business works, I really hadn't considered the enormity of the transformational impacts of the coming "Silver Line" heavy rail service to those parts of Fairfax and Loudoun Counties, especially of course, Tysons Corner, where the service will have the most transformational impacts, even though the ostensible purpose of the Silver Line is to provide subway service to Dulles Airport. Tysons Corner today. Image: KGP Design Studio, LLC- Washington. 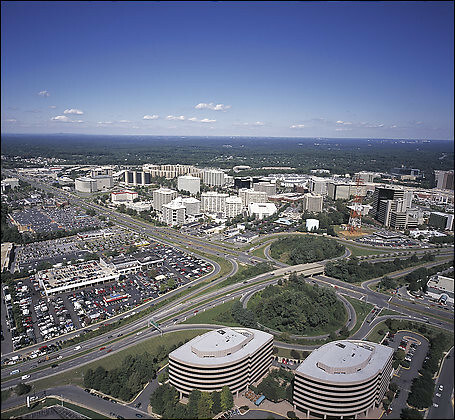 This photo looks east at the interchange of Route 123 and Route 7 (Leesburg Pike) in Tysons Corner. An elevated rail line with four stations will be built down the median of Route 7. Eventually all those parking lots will be redeveloped into residential and commercial buildings, plazas, etc. It's going to take 20-40 years to see the full impact, just as it has taken 25-30 years from the opening of the Orange Line in 1978 to see the growing impact on Arlington County's Rosslyn-Ballston corridor from transit oriented development and the positive effects on business development, recruitment, housing development and resident attraction, and sustainable transportation. Routing map, Silver Line WMATA. Washington Post graphic. Just as Arlington County spent more than 10 years in advance of the opening of the subway on planning and changing their land use and transportation polices and practices to leverage the opening of the subway system, Fairfax County government and its developers, especially with regard to Tysons Corner, are changing their land use policies to refashion the area from a car sewer to one that is oriented to transit. 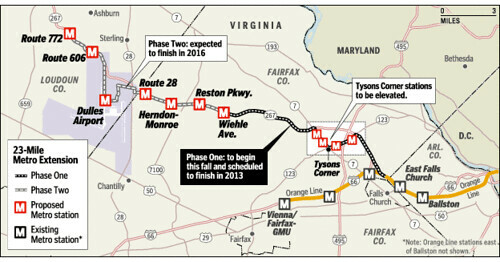 The new sector plan for the area, even the creation of a bike master plan for Tysons Corner, are some of the steps that are being taken in advance of the opening of the Silver line. See this presentation from 2004, "The Future of Tysons Corner: A Fifteen-Point Blueprint for the New “Downtown” of Northern Virginia" by the University of Maryland Smart Growth Center. BUT, the developers there are thinking even longer term and on a bigger stage, about how they will be able to create an area that is fully competitive with and preferable to Downtown DC. This makes yesterday's editorial in the Examiner, "Virginia's white elephant needs to be put down," which advocates for the shutting down of the Silver Line subway line, absolutely hilarious because it is so disconnected from the reality that is being shaped and constructed and built by the developers. But the average current population between Reston and Ashburn is just 3,500 per square mile -- less than half the state's own minimum density requirement and far short of the optimal 15,000 persons per square mile found in central urban business districts. Dulles Rail also depends upon massive new commercial and residential development clustered at or on top of the new stations. Perhaps this was a reasonable assumption back in 2002, when the preliminary environmental impact statement was being prepared, but it is a flight of fancy in a post-2008 world where commercial space in the suburbs is already overbuilt and financing for speculative ventures is virtually nonexistent. With regard to the third paragraph, the developers see the Silver Line as absolutely essential to maintaining the submarket's relevance and competitiveness and as a place to continue to build. And the paragraph is fatuous anyway. The Tysons submarket is one of the most significant real estate markets in the U.S., even today, in the downturn. While I am the first to discount people thinking-writing about how their communities are unique and exceptional, the fact is that DC is one of only four relatively active and somewhat thriving real estate markets in the U.S. (the others are NYC, San Francisco, and West Los Angeles), and that is the context in which policy needs to be made, not about what's happening in Phoenix or Charlotte, NC or Miami or Atlanta. DC's commercial real estate market is again one of the strongest in the world--because of the federal government (3/4 of the space leased up in the region in 2010 was leased to the federal government) the real estate market here is a relatively "stable state" economy, even in bad times, and investors active on an international basis appreciate the relative safety that provides to their investments. Furthermore, with regard to the population density metrics recounted in the second paragraph, again, the issue isn't what the densities are today, but what they will be in 30 years, after the transit system opens, and after land use has become more congruent with access to transit and has bulked and densified up. I can almost guarantee that Barbara Hollingsworth, the writer of that opinion, was never in Virginia Square (now the GMU-Virginia Square subway station area) in the late 1980s, before the land was reproduced in response to the improvement in the economy and the increased value of the land, which converted marginal single family housing and low scale old strip shopping centers into multistory office and residential buildings, complemented with new retail. People who have only been in the region the past 5-10 years have an inability to picture how it used to look, unless they've frequented places like Liberty Road in Baltimore County, after a number of car dealerships and large retailers closed down. Empty. Forlorn. Not today. According to all the panels at the Bisnow conference, the development paradigm in the United States, because of the changing preferences of not just Generation X and Y, but also aging baby boomers who don't want to have to maintain big houses and yards, or drive everywhere, is moving to mixed use and the creation of live-work-play environments. Hollingsworth has swallowed the wrong story about the purpose of the Silver Line. It's not being built to make it easier for airline passengers to get to and from the airport, it's about intensifying and repositioning land use in Fairfax and Loudoun Counties in ways that make those communities just as competitive in the 21st century as they were in the past 50 years in an automobile-dominated development paradigm, as the real estate market repositions in an environment where more and more people want to live close to work, and live close to amenities, without having to rely on an automobile to get them from place to place. The Silver Line might cost $30 billion, but the economic development impact from being able to refashion and redevelop land use there will be 10x, 20x, or 30x that amount--or more! Frankly, in terms of maintaining DC's competitiveness as a place to locate business in the region, the discussion by some of the developers on the panel with regard to the repositioning of this part of the region as transit oriented really chilled me. It made very clear to me that --as I write often--in terms of maintaining DC's economic competitiveness and various competitive advantages in the context of the regional economy, expansion of the subway system within the city ought to be the city's #1 economic development policy. 1. That means the separated blue line. 3. And even a cross-city connector in upper northwest. The fact that the value of transit was minimized by the Vincent Gray Transition Team both in the transportation paper and the economic development paper is equally chilling. Pretty much, the transportation report ignored the value of transit to DC's economy and quality of life. o The first step is to address traffic congestion in order to increase the attractiveness of travel into and out of the District for conducting business. BUT ALL OF THE COMMITTEE'S RECOMMENDATIONS FOCUSED ON AUTOMOBILE TRAFFIC! The District should work with its regional partners to develop a traffic plan to prepare for the regional implications of the redevelopment. • Streamline major access and egress routes between the District and surrounding jurisdictions. The District Department of Transportation can work with its neighboring communities to make significant changes in the direction of streets during peak hours to move people quickly through these corridors. • Removal of parking meters should be considered if the transportation artery should be clear throughout the day. Strict enforcement of double and no parking violations must be carried out in a consistent and timely manner. 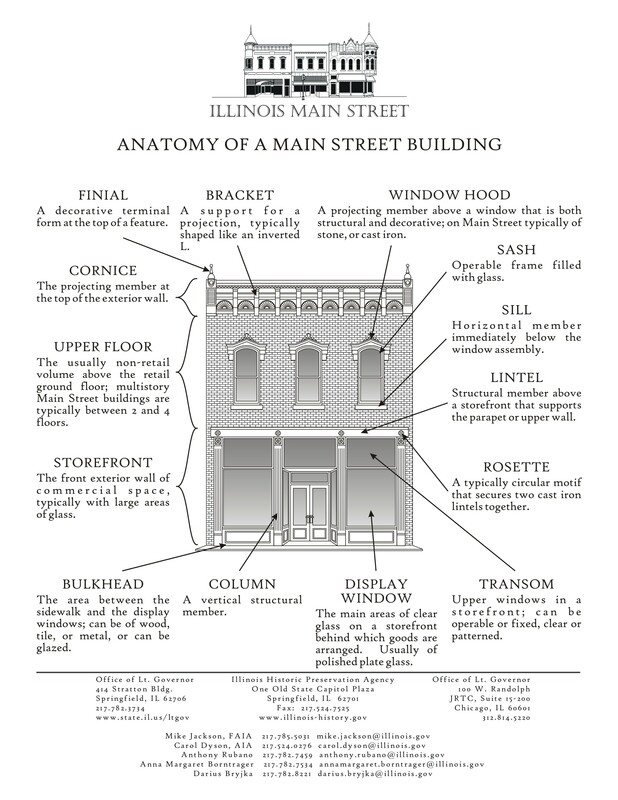 The District should begin to identify the major intersections that provide access and egress from surrounding jurisdictions. These intersections should be staffed with trained traffic professionals to immediately enhance traffic flow. Consideration should be given to securing cost recovery from appropriate neighboring jurisdictions. Meanwhile all the developers in the area impacted by the Silver Line are re-organizing their focus around transit. The Northern Virginia Growth Machine knows where it's at. -- Alexandria's creating an increment tax district to fund the infill Potomac Yard subway station, plus they are considering a incremental tax on all commercial property to fund transportation infrastructure. Hey, while better timing of traffic signals is important, it's really not key to DC's transportation and economic development policies.